I feel privileged to review this unassuming little gem of a chapbook. It’s a debut collection from a young poet and, as such, it has received reviews that are positive while at the same time mildly condescending, with some reviewers noting that the poet’s voice ‘is still developing’. I’m sure the same could be said for practically any poet, regardless of age! 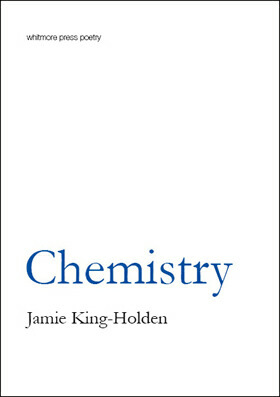 I really admire this volume and I think Jamie King-Holden’s Chemistry is a powerful work that can sit proudly beside books from older, more established poets. moccasin held gently in his teeth. As I unravel like a helix. In many ways, the book relates a coming-of-age journey, in which the poet learns many things—from matters of science to matters of the heart—all amid the familiar (and somewhat foreboding) backdrop of suburban Australia. The scribbled address you left on the fridge. As a poet, King-Holden is curious about how the world works and the heartaches people quietly carry with them. Her poems are grounded in urban realism, and yet at the same time, they are surreal, too. In ‘Postcard of a sunset’, the poet claims to be a ‘free spin on Wheel of Fortune’ and ‘a sentence in a garage-sale Golden Book’. Park, and lost his voice in the black hole of his chest. Face frowning at the universe. These poems are brave and honest; they acknowledge the despair of everyday life and challenge the reader to consider the cruelty and eccentricity of society—to discern its contradictions and common horrors. The poet invites readers to partake in these conversations, to recognize themselves in the familiar scenes and spaces she depicts in her poetry, and to question definitions of normality and, indeed, humanity. And such an offer is simply too good to refuse. Limited copies of Chemistry can be ordered from Whitmore Press, with each book signed and numbered by the author. This entry was posted in Arts, Books and tagged book review, books, chemistry, lip verse, poetry. Bookmark the permalink.